Politeknik Negeri Cilacap - Politeknik Cilacap or Cilacap State Polytechnic is a rapid growing state-owned vocational college (Polytechnic) in Indonesia, based in Cilacap, Central Java Province. Politeknik Cilacap is located at Jl Dr Soetomo No 1 Sidakaya, Cilacap 53212. The college was established in 2014 with the legal basis the Minister of Education and Culture Regulation No 102 of 2014. 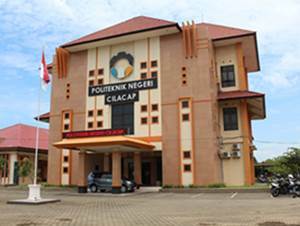 According to Politeknik Cilacap's profile as cited by JobsCDC.com, Cilacap State Polytechnic now host 3 associate (D3) studies programs, comprising Informatics Engineering, Electronics Engineering, and Mechanical Engineering. Master Degree (S2) in Electro Engineering. Have competencies in the field of electricity. Master Degree (S2) in Mechanical Engineering with the areas of expertise in Manufacture, Design, Material or Energy (linear). Candidates with teaching experience at least 1 year is preferred. D3/D4 in Informatics Engineering, Computer Engineering. Expertise with programming based on web/desktop/mobile. Expertise with database programming.1 position available. Bachelor Degree (S1) in Civil Engineering. Possess expertise certification is preferred. Able to calculate the Budget Plan. Operating knowledge of AutoCAD, Solidwork and other related drafting application. Not being in a bond / contract with any party. JobsCDC.com now available on android device. Download now on Google Play here. Please be aware of recruitment fraud. The entire stage of this selection process is free of charge. Politeknik Negeri Cilacap - Technician, Staff, Lecturer NON CPNS Politeknik Cilacap October 2016 will never ask for fees or upfront payments for any purposes during the recruitment process such as transportation and accommodation.